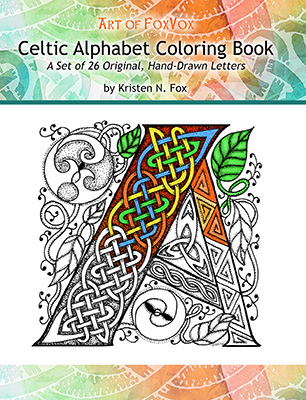 The original, hand-drawn alphabet in the Art of FoxVox Celtic Alphabet Coloring Book includes classic Celtic elements such as intricate knotwork and circular spiral art, as well as leaf and vine motifs. The compositions and decorations are uniquely tailored to each letter so no two are exactly alike, but together make a beautifully cohesive set. Color for stress relief, or color them for the fun of it – following the knotwork as it loops around, and seeing where the path takes you! knotwork and circular spiral shapes to create unique works of art. Each piece has its own signature style and level of detail for a diverse coloring experience. 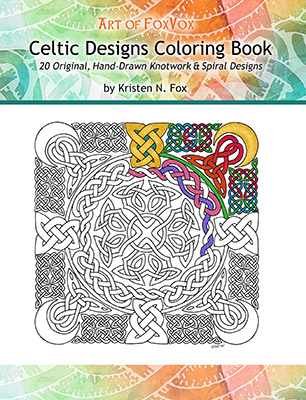 Let your mind relax and your creativity take over as you move along the lines of knotwork and the swoops of the spirals! diverse coloring experience. And they are also great for releasing stress and as focal points for meditation. 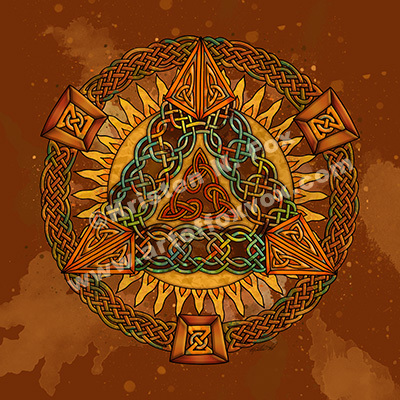 I’ve got new art to share – the Celtic Pyramid Mandala! The official description – “The Celtic Pyramid Mandala features triangle knotwork in copper verdigris multicolors, surrounded by sun rays and more knotwork, like an ancient Celtic-Egyptian-Aztec-Mayan fusion!” I had a lot of fun giving this piece textures and odd colors to make it look weathered and ancient. I think part of my subconscious influence in this design may have been the first Tomb Raider movie – heh. The Art of FoxVox Celtic Stormy Sea Mandala is a deep sea of abstract blue, green, and dark purple shapes – spirals and knotwork, and movement that seem like octopus tentacles, flowing seaweed, hunting shark fins, irridescent oyster shells, spinning whirpools, and stormy waves! I chose colors that reminded me of the deeper, duskier tones that happen when a storm stirs up the deeper parts of the ocean. 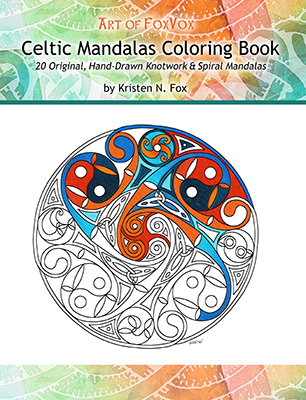 Click here for all of the Celtic Stormy Sea Mandala items, from apparel and shoes to playing cards, mugs, etc. 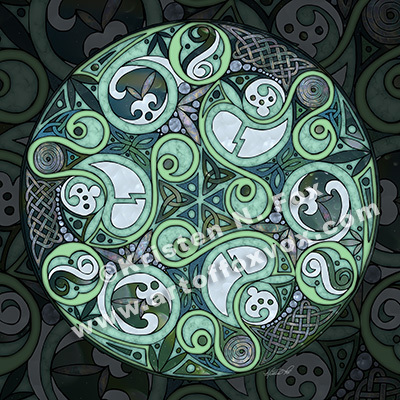 The Celtic Stormy Sea Mandala also looks rather cool on home products – Shower Curtain, King-Queen-Twin Duvet Covers, Pillowcases, Throw Pillows, Clocks, and more! You can also decorate your wall with the Celtic Stormy Sea Mandala as a fine art print – framed or unframed, and as a canvas print as well. Just click the framed image at the right (or click here) to see what options would look good on your wall. (I tend to think that most mandalas are also handy as a meditation focus.) Anyway, click on the framed image to see a larger zoom image of the actual design too. The Celtic Wheel of the Year represents the cycle of seasonal pagan festivals – eight holidays based around the solstices and equinoxes (Yule, Imbolc, Spring, Beltane, Midsummer, Lughnasadh, Autumn, Samhain), with holiday names and dates and symbols. In the center circle, stick-like Ogham letters represent the 13 months of the lunar calendar (that’s my own special addition to the wheel). It’s decorated with circles of Celtic knotwork & oak leaves, and the entire calendar looks like it was painted on parchment and mounted on a round wooden frame, tied together with knotted cords, for a touch of that primitive look. Click here for all of the Celtic Wheel of the Year items, from apparel and shoes to playing cards, mugs, and more – gazillions of them (actual number may be lower)! 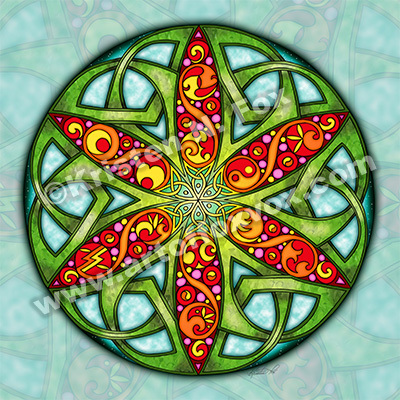 And, last, but not least, this unique version of the Celtic Wheel of the Year is available as a wide variety of Fine Art Prints. You can get a print with or without framing, or even as a canvas print, through our gallery at Imagekind. It’s fine art, and also a calendar that you’ll never need to change – a twofer – heh. So… bird standing on one leg in water with the other bent? Check. Impossibly hard to pin down pink-orange color-changing feathers? Check. Neato Celtic knotwork border in matching colors with subtle hints of the shape of the flamingo’s beak at the edges and a hint of the shape of a bird taking flight at the corners? Check. 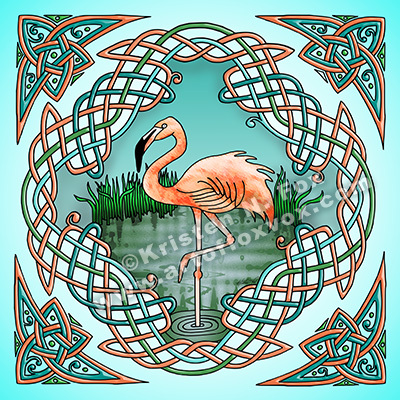 Celtic Flamingo Fine Art Prints – Yup – a flamingo for the wall too! Framed or unframed, or as canvas prints. Click here and you can pick your own sizes, mats, frames, and canvas wrap, and other options from the Art of FoxVox Fine Art Gallery at Imagekind. Thanks so much for flamingo-izing with me today and hopefully tolerating all of my exclamation points! A while ago I was sifting through some of my abstract photography – photographs that are mostly colors and textures and patterns, mainly from nature – and an idea popped into my head! What if I combined an abstract photo with an interesting piece of Celtic knotwork? The idea really tickled my brain, and here’s the first ‘hybrid’ design – Celtic Rock Knot! I actually used a photo of metallic corrosions, rust, and mineral deposits, and after combining it with a simple knot, and added depth and chisel marks in photoshop, it came out looking like it was carved from rock – I just really love the look! I love it on the colored t-shirts and such, but also on products with the original photo as background, like on the pillow, journal, and the messenger bag. Click here to browse Celtic Rock Knot t-shirts and bags, and such. Also, Fine Art Prints of the Celtic Rock Knot Art are available, with or without framing, or even as a canvas print, through my gallery at Imagekind. (In the sample image here I chose an interesting gray framing option – neat!) Click here for a zoom image of Celtic Rock Knot, and to see it displayed in another format, etc. Thanks for looking! 🙂 And I already have some new ideas for more abstract photo and celtic hybrid art, so stay tuned.